Thai Chicken Curry, World's Best Recipes! As a Thai chef, I have been making Thai curries for over 20 years, continually tweaking the recipes to make them better and better. You'll find they're also easy to follow, and as a bonus, you'll find the recipes so much healthier and also fresher tasting than many restaurant curries simply because you get to choose your own (fresh) ingredients. The paste or curry sauce is also made fresh, not pre-made and sitting around - that makes a big difference. And if you like, you can make them 100% organic and/or gluten-free. Enjoy! A golden-hued Thai chicken curry simmered with individual spices, fresh herbs, and a hint of cinnamon. A swirl of coconut milk is added at the end which adds a rich, creamy texture for the ultimate Thai taste. Whole chicken pieces, such as drumsticks, lend very tender results, and chunky wedges of potato round out the dish. This delicious Thai green curry is made quickly & easily in your wok. You'll love its true Thai taste and all the various layers of flavor. ENJOY! Green, Yellow, and Red - the three colors of the most popular Thai curries. There are many versions of red curry - two others are included on this list (see "Jungle Curry" and "Penang Curry" below). What makes Thai red curry red? Chili, of course! So if you like spicy, you'll love this red curry chicken recipe. Like yellow and green Thai curries, red curry easy to make, fragrant, and healthy too. As a bonus, this red curry is very easy to make. ENJOY! This classic yellow chicken curry is simmered with potatoes in a richly flavored curry sauce made with dried and fresh herbs and spices plus coconut milk. It's a classic curry chicken you would find on the streets of Bangkok, and now you can make it at home in your very own kitchen! Penang Curry can be made with either beef or chicken, according to your preference. Named after a state in northern Malaysia, this special curry dish carries with it flavors and aromas of distant places (you'll find references to Malaysia as well as India and Burma). With its homemade combination of spices and fresh herbs, my Penang curry is super healthy, and the red vegetables such as tomatoes and red bell (or sweet) peppers add extra vitamins, flavor, and texture to this wonderful dish. Indonesian cuisine has always been influential in Thai cooking. One of the more popular Indonesians dishes in Thailand and throughout Asia is Rendang Chicken or Beef Curry. Rendang is considered a "dry" curry, which means the sauce is simmered down to a minimum. Because it is so distilled, the sauce sticks to the meat, making this dish one of the most flavorful I have ever tried. And its wide variety of spices makes it extremely healthy. If you like curry, you'll love Rendang - guaranteed! This sumptuous Coconut Curry Chicken recipe is cooked entirely from scratch, yet is very easy to make. To save time, here I've dispense making a separate paste - all the ingredients are simply set into the curry pot as you have them ready. It comes paired with sweet potato or yam for just a touch of sweetness in an otherwise savory Thai curry that's just perfect for fall. This Thai spin on classic green curry recipe is exquisitely Thai in taste, flavor, and texture. Made with a lime leaf as well as lime juice, the curry paste is extremely aromatic and dark green in color. It is similar to classic Thai green curry, but also delightfully different. If you like Thai flavors, you'll love this unique curry! Massaman Curry is a popular dish from the south of Thailand. 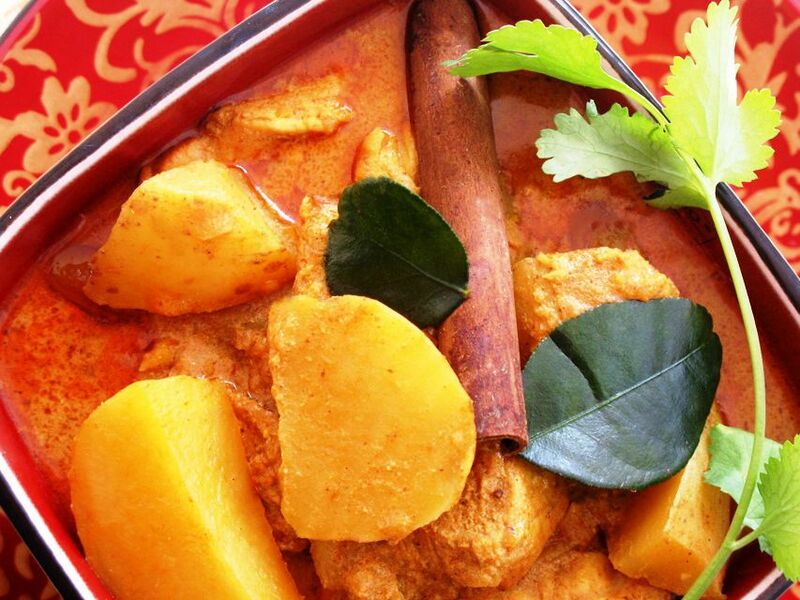 Its flavors are indicative of Malaysian curries, with warm spices like cinnamon, cardamom, and cloves. Added to this mixture are lemongrass, red chili, plus cumin and coriander seeds cooked together in coconut milk for a fragrant, rich-tasting curry. Serve this fantastic chicken curry with coconut rice plus a cold lager for a complete Thai treat (recipe included)! This Northern Thai recipe for chicken curry features warm spices in a fragrant homemade curry sauce that's put together right in the pan/wok (without having to make a separate curry paste). Chicken is combined with potatoes, and vegetables can also be added if you desire (eggplant is delicious). If you enjoy both Thai and Indian curries, you'll love this warm and flavorful dish. Thai Jungle Curry - go wild! If you like chicken curry, try my Thai Jungle Curry, which is based on a famous dish from Chiang Mai. Spicy and layered with flavor, this curry is a splendid variation of red curry. Usually made with wild meats (which most Westerners would have trouble obtaining and stomaching), here I've created my own version using chicken. I've also replaced the original broth with a little coconut milk, which I find adds more thickness and flavor to the sauce. Note that Jungle Curry can also be made with pork or other red or wild meats of your choice.